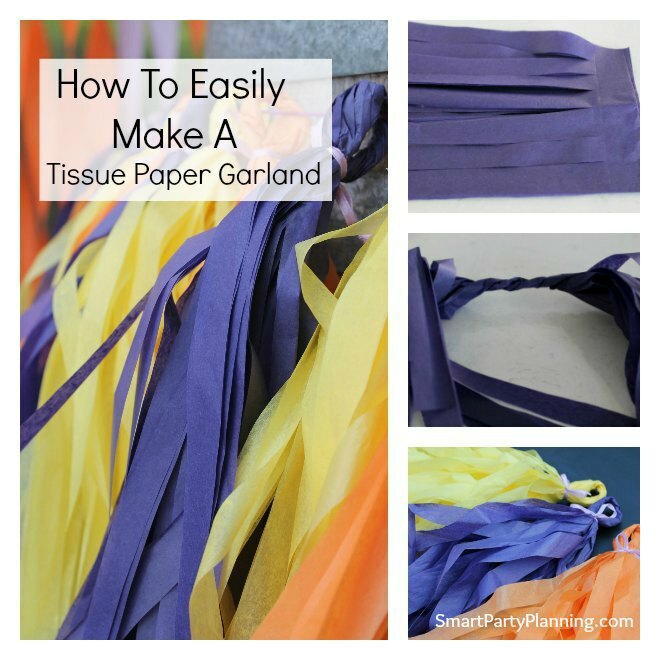 Inside: A simple tutorial for making a tissue paper garland in 10 quick steps. This will soon become a favorite DIY party decoration. One of the great things about tissue paper decorations is that they are cheap and easy to make. Not only that but they provide a splash of color which look amazing displayed at all types of parties. This tutorial will show you how to make your own DIY tassels to use for decorating the party table or for use as a party backdrop. Simply pick the color to match your party theme. A tissue paper garland is the perfect way to create amazing looking party decoration in the easiest way possible. Tissue paper garlands seem to be all the rage now. If you walk into any party store you will see them hanging there in every color and style. The problem is, that they have a rather nice price tag to match. Ok, so pre-buying the tassels will certainly save you a ton of time, but if saving on the budget is a priority, then making them is a great option. You don’t have to be an awesome crafter to make these. If you can fold tissue paper, then you fully qualify. With a little bit of time and patience you will have your tissue paper fringe garland ready to rock and roll at the birthday party. This is something that you can easily do whilst sitting in front of the television at night. You can also easily mix and match the colors to suit the party theme, which makes this one of the best party decorations you can find. There is nothing worse than seeing an awesome decoration idea, but when you look at the tutorial it requires a million implements and 10 hands to complete the project. I know, I have been there, I have tried and I have failed. Miserably! You will be pleased to hear that this tissue paper garland is NOT one of those crafts. You also don’t need a huge amount of supplies to make the garland which is also a big relief. Here you will find a list of all the items you will need. The only thing you are likely to have to go and buy is the actual tissue paper! Step 1: Spread the tissue paper out flat on a bench and smooth out the creases. Don’t worry about being too fussy with these creases as they really won’t notice when the garland is made. Step 2: Fold the tissue paper in half. Step 3: Fold the paper in half again. I did mention that these steps were easy didn’t I! Step 4: Cut along the side folds, leaving your main fold at the top. Step 5: With your fold remaining at the top, measure approximately 2.5 cm down. Draw a line with a pencil. Step 6: From the bottom of the tissue paper, you will need to cut straight lines up to the pencil mark that you have drawn. Once again you don’t need to be too concerned with how straight these lines are. If you really wish to have super straight lines and tassels of equal size, you can measure and then cut, but if you want to achieve the job in half the time, it’s really not necessary. Step 7: Open up the tissue paper. You should see that the uncut portion of the tissue paper is now sitting in the middle. Step 8: Focusing on the middle uncut section, start rolling the sheets over each other. Try and keep these twists as tight as possible. Step 9: Once rolled, twist the center section and form a loop. Step 10: With your look formed, secure in place with a piece of curling ribbon. There you have it. Your tissue paper garland piece is complete. Now simply repeat the process and make the garland as long as you wish. To put all the pieces together, simply thread some curling ribbon or twine through the loops and hang where you please. Plus, once completed they look amazing and everyone is going to think that you bought them. Whilst I love the tissue paper garland, I also love using plastic tablecloth’s in my party decoration. They are another great way of providing easy party decoration at a very minimal cost. If you want to expand on the garland idea, you can even make them out of plastic tablecloths which will provide a lovely contrasting look. 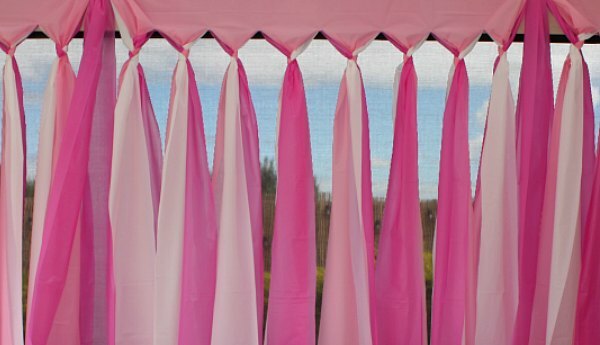 The tutorial to make a plastic tablecloth garland is very similar with just a few tweaks. Maybe this would call for another girls night, so you can make up another batch of garlands. I can think of worse things to do! How To Make A Party Backdrop – This is an easy backdrop idea that can be tailored to any party theme by simply changing the colors used. 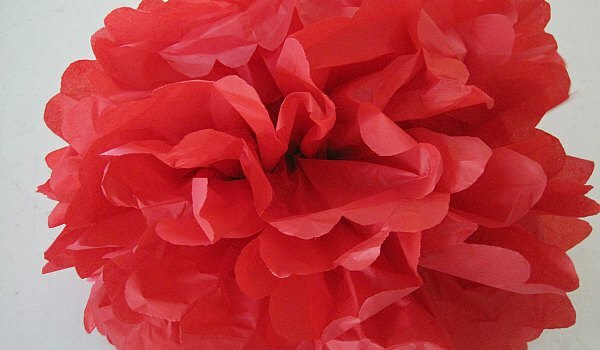 Tissue Paper Pom Poms – Pom Poms add an awesome splash of color and they are super easy and cheap to make. Let’s stay in touch. If you loved the tissue paper garland tutorial, sign up the to the newsletter so you never miss out on other easy party ideas. You will also gain access to a ton of printable’s for free! If you want to stay up to date on our posts, follow us on Pinterest.